The Modesty Walk: Dressing Feminine and Winter Sports! Dressing Feminine and Winter Sports! I saw this picture in a newspaper and thought it would be nice to share it with you all! Who loves winter sports around here? Anyway, I love these pictures too because it reminds of a time where the moral standards were higher. The more time passes, the less moral standards humanity has. It’s quite frightening, especially when I think about our kids future, but I know that we can still be a difference in this decaying world! I also love how the lady seems so content skiing in her skirt, (not thinking "oh this is ackward" - it was the norm!) and the girls skating in their skirts, which appear to be attached to shorts underneath, pretty cool, although I would wear my skirt a little more knee length. Lol…. 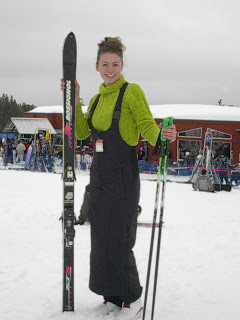 When I was younger I went skiing in a skirt and I had such a great time. I remember considering skiing so thrilling and fun!! I also learned to skate a very young age and have never had difficulties doing that in a skirt either. Now in days, there are also apostolic seamstresses that make sporty & skiing skirts for outdoor activities. I came across this lady a few months ago, from Modest ActiveWear and found the work she does pretty neat! If you are an outdoor girl, maybe you could check her out here. You can also read this Post I did a few months ago about sporty skirts here. Oouu thats cool. I shall check it out . It seems from your blog that you are a fashion and skating freak.